As promised in my yesterday's post, I've come up with various organizations and groups where you can course your donation to help the victims of Typhoon Yolanda (aka Typhoon Haiyan). 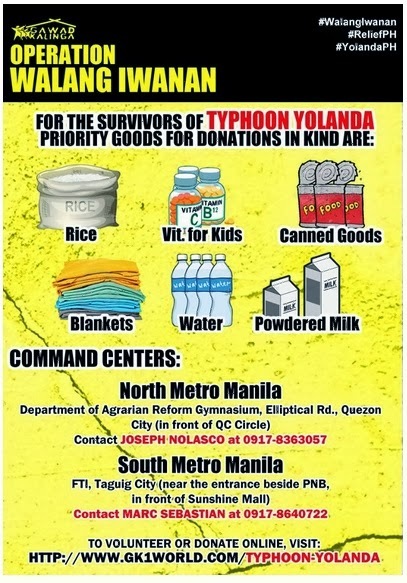 GAWAD KALINGA has activated Operation Walang Iwanan: Typhoon Yolanda as a relief campaign to rally friends and volunteers together in bayanihan spirit. We are appealing for donations in kind and cash to help rebuild the hardest-hit areas of Iloilo, North Negros, Ormoc and Cebu. Team GK is repacking and distributing food packs containing a combination of rice, canned goods and water. Each food pack costs Php200 ($5) and is good for 4-6 meals for a family of 5. We are targeting 50,000 food packs* given the magnitude of the need. **As of November 13, 18,500 food packs are being repacked and distributed. Despite challenges on logistics and weather, Team GK continues to push and cross the limits. Help us bring concrete hope to our fellowmen in their moment of greatest need. When giving via bank deposit, please scan the deposit slip or take note of the transaction number and email to partnerships@gk1world.com with the following details: Name of Donor, Date of Deposit, Amount, BPI Branch. Please indicate that your donation is for Operation Walang Iwanan: Typhoon Yolanda (Haiyan). Nations have been overflowing with support and certainty that the Philippines can rise up from one of the world's strongest hurricanes in recorded history. In the words of Team GK's Kuya Luis Oquiñena: "[These victims] survived Super Typhoon Yolanda. Let us together help them live." Visit Gawad Kalinga's official site to learn more or Gawad Kalinga's official Facebook page for the latest updates on Operation Walang Iwanan! I've been a UNICEF champion for more than a year but sadly my monthly donation/contribution had to stopped due to my financial challenges of being the sole income maker a few years back. I believe in the advocacies and the mission of UNICEF in helping the children around the world. That's why I won't hesitate this time to simply donate what I can. I urged every Filipinos around the globe to help save the future of our children. After all our national hero believes in them that they are the hope of our mother land. Post by The District Cavite. 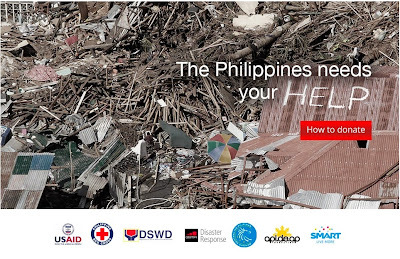 Post by Philippine Red Cross. It's no secret that I loved animals most especially dogs. They have a special place in my heart thus I want to call out to pet lovers like me to help and donate a little extra money that you may have to our furry friends. I bet that not all people are aware that animals also needed care and attention after the typhoon's disaster. As Cesar Milan explained, animals also experienced stress and trauma. Post by Philippine Animal Welfare Society (PAWS). You can send your donations using your mobile and smartphones. 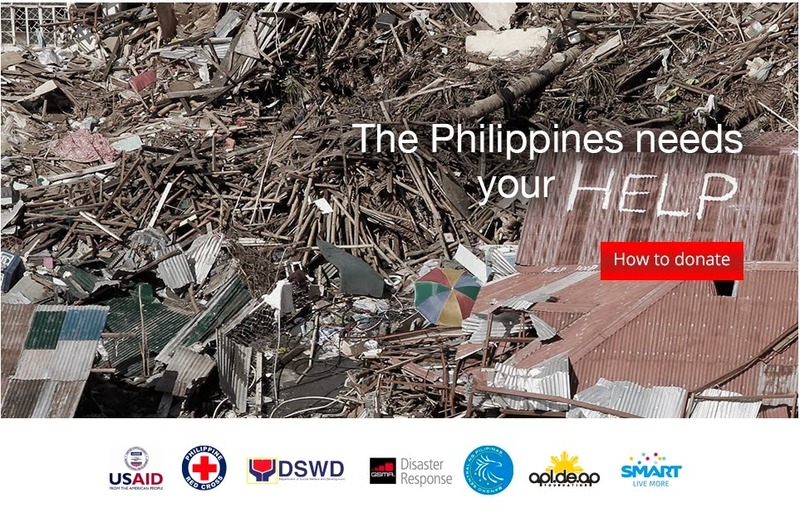 Mobile phone users in over 40 countries can now directly donate using their airtime load to helpPH through BayadLoad, a mobile money service of Smart Communications, Inc. (Smart) approved by the Bangko Sentral ng Pilipinas (the Philippine Central Bank) for this purpose. Sending mechanics from overseas vary depending on the mobile network operators per country. This fund-raising program will continue until December 31, 2013 to allow mobile subscribers in over 40 countries to donate mobile airtime up to $10 a day. Fore for more information, check out their website - helpPH. 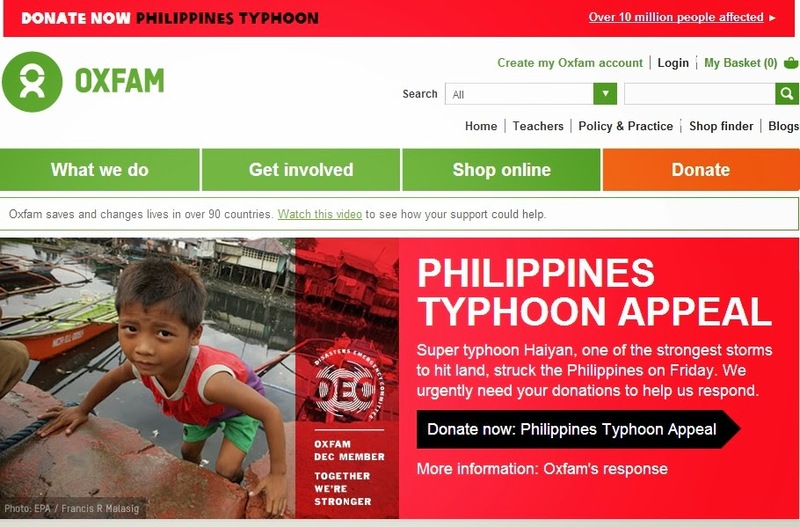 Taken from Oxfam website - "Oxfam is a global movement of people working towards a world without poverty. And we won't rest until we get the job done. We respond fast in emergencies, and stay to help people rebuild their lives. We work on long-term projects with communities determined to shape a better future for themselves. And we campaign for genuine, lasting change." I'm sure you've heard about this organization a countless time, Sagip Kapamilya is the emergency humanitarian assistance program of ABS-CBN Foundation, Inc. They provide food and non-food relief to affected communities of disasters, as well as engage in rehabilitation and disaster risk reduction projects. Apart from their own efforts in sending help through Yolanda victims (please check out http://www.abs-cbnfoundation.com/sk/news-ro_yolanda_info.html#.UolKUMRpnbU for further information about cash donations, hotlines and drop-off pints), they decided to have a partnership with BPI (Bank of the Philippine Islands) where cash donations for relief operations are being accepted by ABS-CBN Foundation, Inc. Sagip Kapamilya through BPI Express Online. How? If a confirmation page does not appear, please check if your account was deducted. To do this, choose "View Account Details" under the "More Options" tab of your account portfolio. Then, select "View my transactions for the day" and click on "View Items" to confirm if your transaction was successful. Donations are deducted from your account real time. Donations done between 10:00 PM and 12:00 AM are considered transactions the next banking day. There are many ways to reach out and lend a helping hand that there's no excuse for us to shrug off our fellow countrymen in this battle. Let's give hope to others just like as we want others to do the same for us.